Last month’s report from the Pew Research Center on political polarization and media habits shows that social media is a prominent way people learn about government and politics. Indeed, this recent survey shows that 48% of internet-using adults reported getting news from Facebook in the previous week, rivaling well-known news media organizations. New data released here support the notion that two of the most prominent social networking sites, Facebook and Twitter, function very differently as sources of political information. Overall, Facebook continues to have a much larger base of users than Twitter (with 77% of web-using adults on Facebook compared with just 21% on Twitter). 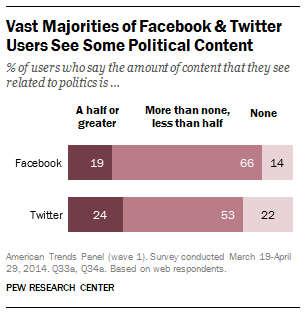 Vast majorities of both Facebook users (86%) and Twitter users (77%) see at least some political content, such as posts from friends, news organizations and political leaders, and links to news stories. And a significant percentage of each – 24% of Twitter users and 19% of Facebook users – say political posts account for at least half of the posts they see. 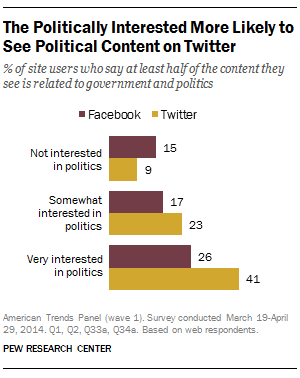 But social media users who are interested in politics have different experiences on the two sites. Four-in-ten (41%) Twitter users who are very interested in politics say that at least half of the posts that they see are political. This compares with about a quarter (26%) of highly politically-interested Facebook users who say the same. 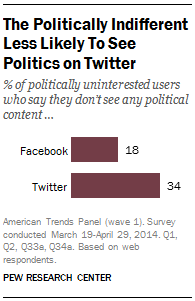 Conversely, roughly a third (34%) of Twitter users not interested in politics say they don’t see any political posts in their feed, compared with about half that amount (18%) of Facebook users who are uninterested in the subject. There could be a number of elements at play. For one, as apparent to those familiar with both sites, the nature of each platform is different in terms of who people choose to connect with and how algorithms, particularly for Facebook, affect what people see in their feed. Also, people could be using the two sites for different purposes: Facebook users could be using the platform for a wider array of social and informational activities than Twitter users. But either way, on Twitter, those who are interested in politics see a greater portion of this type of content than their brethren on Facebook, and the politically uninterested are more likely to filter it out. Whether these differences between sites will persist is in question, though, as the type and amount of content that users see is ever changing. For example, Facebook recently announced that it was updating its news feed algorithm since current events sometimes “aren’t surfaced in a timely manner,” according to a Facebook spokeswoman. Changes such as these can continue to influence whether users are actually seeing the content they are interested in. Correction: An earlier version of this post inaccurately cited the percent of online adults who use Twitter. It is 21%.